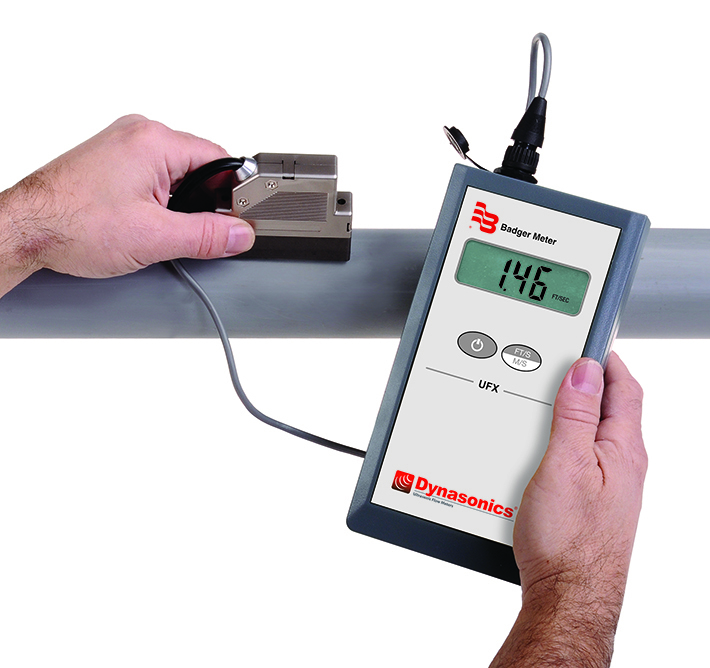 The UFX handheld ultrasonic Doppler flow meter is a cost-effective flow measurement system for closed-pipe liquid systems. The unit employs a non-invasive, hand-held transducer, which is placed on the outside of metal or plastic pipes; and battery-powered electronics packaged in a NEMA 4 (IP65)-rated enclosure. This warranty shall apply to Badger Meter Equipment and Parts (“Product(s)”) sold on or after August 1, 2014. This warranty is extended only to commercial users and authorized Badger Meter, Inc. distributors, hereafter referred to as “Customer,” and does NOT apply to consumers. Badger Meter warrants Product to be free from defects in materials and workmanship appearing within the earlier of either: one (1) year after installation; or one (1) year and six (6) months after shipment from Badger Meter. Product failures must be proven and verified to the satisfaction of Badger Meter. The obligation of Badger Meter hereunder shall be limited to such repair and replacement and shall be conditioned upon Badger Meter receiving written notice of any alleged defect within ten (10) days after its discovery. This exclusive remedy shall not be deemed to have failed its essential purpose so long as Badger Meter is willing and able to replace defective Product to Customer within a reasonable time after receipt of proof that a defect is involved. Product returns must be shipped by the Customer prepaid F.O.B. to the nearest Badger Meter factory or distribution center. The Customer shall be responsible for all direct and indirect costs associated with removing original Product and reinstalling the repaired or replacement Product. This warranty shall not apply to Product repaired or altered by any party other than Badger Meter. The foregoing warranty applies only to the extent that the Product is installed, serviced and operated strictly in accordance with instructions from Badger Meter. The warranty shall not apply and shall be void with respect to Product exposed to conditions other than those detailed in Product technical literature, or which have been subject to vandalism, negligence, accident, acts of God, improper installation, operation or repair, alteration, or other circumstances which are beyond the reasonable control of Badger Meter. With respect to equipment and parts not manufactured by Badger Meter, the warranty obligations of Badger Meter shall in all respects conform and be limited to the warranty extended to Badger Meter by the supplier. THE FOREGOING WARRANTIES ARE EXCLUSIVE AND IN LIEU OF ALL OTHER EXPRESS AND IMPLIED WARRANTIES WHATSOEVER, INCLUDING BUT NOT LIMITED TO IMPLIED WARRANTIES OF MERCHANT ABILITY AND FITNESS FOR A PARTICULAR PURPOSE (except warranties of title). Any description of the Product, whether in writing or made orally by Badger Meter or agents of Badger Meter, specifications, samples, models, bulletins, drawings, diagrams, engineering sheets or similar materials used in connection with any order from the Customer are for the sole purpose of identifying the Product and shall not be construed as an express warranty. Any suggestions by Badger Meter or agents of Badger Meter regarding use, application or suitability of the Product shall not be construed as an express warranty unless confirmed to be such in writing by Badger Meter. The liability of Badger Meter with respect to breaches of the foregoing warranty shall be limited as stated herein. The liability of Badger Meter shall in no event exceed the contract price. (1) ANY OTHER OBLIGATIONS OR LIABILITIES ARISING OUT OF BREACH OF CONTRACT OR OF WARRANTY, (2) ANY OBLIGATIONS WHATSOEVER ARISING FROM TORT CLAIMS (INCLUDING NEGLIGENCE AND STRICT LIABILITY) OR ARISING UNDER OTHER THEORIES OF LAW WITH RESPECT TO PRODUCTS SOLD OR SERVICES RENDERED BY BADGER METER, OR ANY UNDERTAKINGS, ACTS OR OMISSIONS RELATING THERETO, AND (3) ALL CONSEQUENTIAL,INCIDENTAL, AND CONTINGENT DAMAGES WHATSOEVER. The Series UFX utilizes two piezoelectric crystals contained within one transducer to transmit ultrasonic energy into the fluid stream and receive reflected energy off discontinuities, suspended particles or entrained gases, within the moving liquid. When the fluid is fl owing in the pipe (with the discontinuities traveling at the same speed), there will be an apparent shift in frequency from the transmitted sound wave to the received sound wave. The difference between these sound wave frequencies is the Doppler frequency shift and is proportional to fluid velocity. In addition to measuring and displaying fluid velocity, the UFX processor also controls all operations of the instrument from its ultra-efficient battery management circuitry to a proprietary FIR (Finite Impulse Response) filtration program.